DIRECTIONS: Combine 3 tablespoons of the vinegar and 2 tablespoons of the oil in a large resealable bag. Add the pork, seal the bag, and set aside in the refrigerator, turning occasionally, at least 4 hours or overnight. Remove pork from marinade, place it on a rimmed baking sheet, and sprinkle with salt and pepper. Discard marinade. Roast pork until the internal temperature reaches between 145 degrees F. (medium rare) and 160 degrees F. (medium), on a meat thermometer, 25 to 30 minutes. Set aside to rest 10 minutes. While pork is roasting, cook quinoa according to package directions. Drain any liquid that hasn’t absorbed, then cover and set aside. Cut pork into 1-inch pieces. 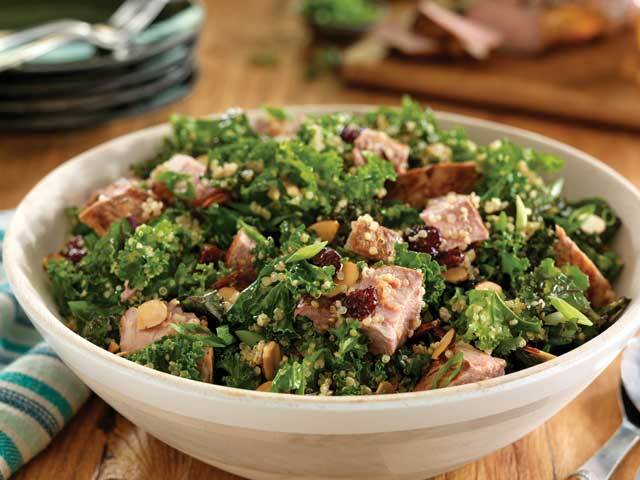 In a large bowl, combine pork and any cooking juices with quinoa, cherries, scallions and 2 tablespoons of almonds. Gently stir in kale or spinach, remaining 2 tablespoons of vinegar, and remaining 1 tablespoon of oil. Add more vinegar, oil, salt, and pepper to taste. Garnish with remaining 2 tablespoons of almonds and serve. *Recipe courtesy of "Pork, Be Inspired".